Not the win I was hoping for BUT..... This is 36. And now is the time where I post a kickass picture of me with my finishing medal..
Only problem being is that I had my very first DNF this past weekend and boy did that sting. I felt confident in this race. I had put the time in. The grueling hours on the lonely trail runs. I overcame my fear of running alone on trails sometimes running for hours in a heatwave with the blazing sun and no shade. Running in the middle of the day if I had to because when you're a mom, your schedule is not as flexible as it once was. I also mentally prepared myself for this race and believe it or not I was looking forward to being, as I called it, "lost in the woods" for 10-12 hours. See, ultras are not only a physical challenge, but it's a soul journey as well. Running for me has never been about the physical challenge, it's about the mental one. It's about my process of doubting myself, of releasing all unwanted energy, of reconnecting with myself and my breath, of having no one to depend on to finish but myself and of being one with Mother Nature. One of my favorite things about running is that it doesn't discriminate. Just because you're fit or muscular doesn't necessarily make you fast. You see, runners of all ages, sizes, race, sexual preference, etc. come together for one single purpose and that is to receive and experience the glory of all your hard training and ultimately to cross that finish line. And those strangers at the start of the race all of a sudden become like family at the end. The pain and memories you experience running those miles bind you. But the universe had other plans for me this past weekend. I have never felt so incapable of continuing a race, let alone finishing it. Vomiting all night long with only a few hours of broken sleep and nothing in your system your body is just depleted. I couldn't even hold water down let alone food to use as a source of fuel for the run. The walk back was the toughest. The tears just flowed. I am not sure I ever cried like that in public before. I couldn't help it; I was CRUSHED! My thoughts raced with memories of this past year. 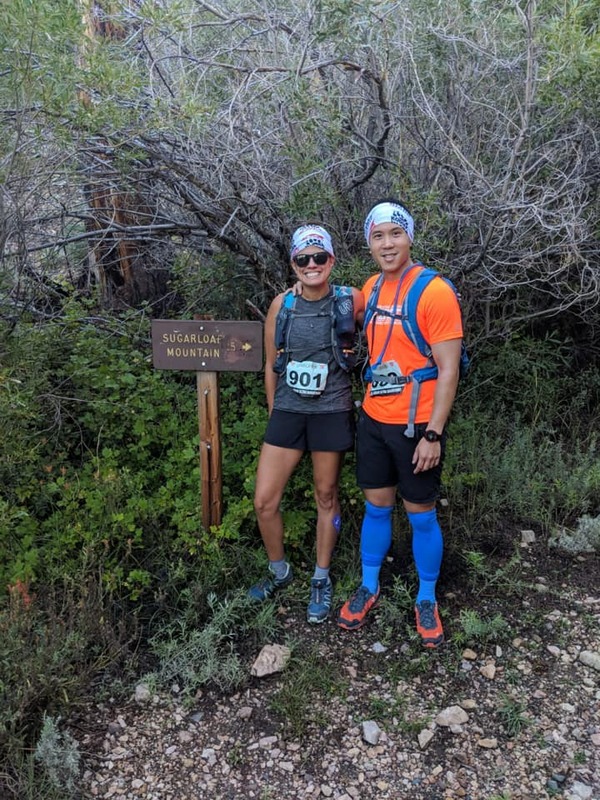 I was two days shy of my 36th birthday, and I recalled why I signed up for this race in the first place. Looking back at 35 I see a lot of growing pains that had to happen, and I have healed myself on such a core level, anyone who has done this level of healing knows how draining and difficult it can be both on an emotional and physical level. I wanted to leave that all in Big Bear and come back ready to conquer 36 with a clean slate! Every runner I passed on the way down offered words of encouragement, stopped to see if I needed help getting back to the start and others were offering me every kind of ginger treatment they had in their camelbacks to help me stay on course. They felt my pain and wanted to help. But nothing worked and I handed in my bib and went back to the hotel. After a good cry and nap, I wiped my eyes and knew it was time to go out there and cheer on my fellow runners. The runners slowly trickled in 1 by 1 crossing the finish line, so I had a lot of time on my hands, and of course, I was pondering the question as to what was the lesson here. What did I NEED to learn from this experience? First and foremost I know listening to my body was the right choice. Although it didn't feel like it at the time and it still doesn't feel good, it was the right thing to do, and by doing that, I was flexing my self-love muscle and practicing self-care. Second. I so miss my running community and racing in lush greenery. It's not about being fit or accruing miles. It's about my need to be alone, to run away from my thoughts, to reconnect with mother nature. I mean my nickname isn't squirrel for nothing? Third. I recalled what a top sports therapist in NYC said to me years ago when I first started racing. He said, "It's about time you find a different passion because your body just isn't capable of running for much longer." But I think the most valuable and poignant lesson for my 35th year of life is that some things are just out of your control. No matter how hard you worked for it and no matter what you wanted the outcome to be sometimes it is just not written in the stars. And that's ok because maybe what I was suppose to get out of this trip wasn't my soul's journey to endure a 50k in the mountains perhaps it was just to be able to connect with a running community as awesome as these ultra runners. To finally be around people as crazy as me who crave the wilderness, who crave a challenge. The west coast hasn't felt like home to me, and this past weekend I finally felt that familiar feeling again. The sense of belonging, the feeling of finally being home. 35 You so humbled me but 36th I welcome you and the freedom it brings along with it. No judgment only acceptance and manifesting the life that I want and deserve!